BAKERSFIELD: The Bakersfield motorcycle accident lawyers at Riderz Law have yet another unfortunate accident to report. A CHP officer was injured in a motorcycle accident earlier this week in downtown Bakersfield. According to reports, the CHP officer had stopped his motorcycle to pull over a driver when another car turning left at an intersection slammed into him from behind. The driver apparently failed to see the officer or his motorcycle. Our prayers go out to this officer for a speedy recovery. Even seasoned riders such as this CHP officer are not immune from possibly the biggest danger that faces us motorcycle riders: we are often invisible to drivers on the road. Time and time again, drivers simply aren’t paying attention and fail to see motorcycles until it’s too late, as in this unfortunate incident. 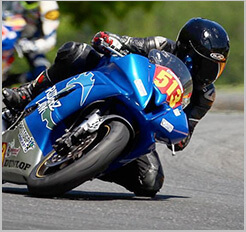 As motorcycle accident attorneys and as fellow riders, we see this problem all too often. It is unclear what precautions were taken by this CHP officer, but whenever you need to pull off the road, make sure you are as far off the road and onto the shoulder as possible. Also make sure that your hazard lights are on and, where possible, that you deploy hazard signs or flares to further alert drivers to your presence. A few simple precautions could save your life.